Introducing Diablo, the Master of Alchemy - the latest in a long line of classic Lee/Kirby villains! 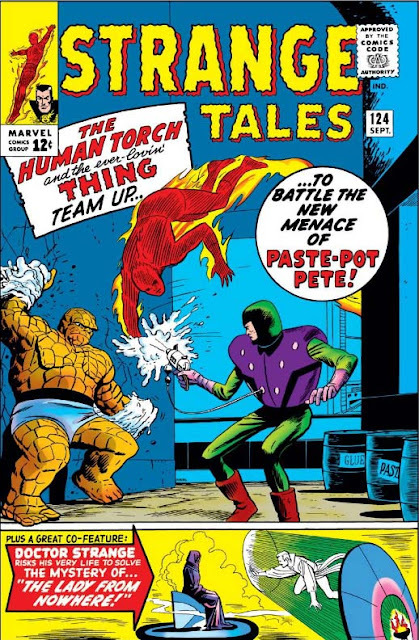 This issue starts with the action in full swing, with the FF in the danger-filled woods of Transylvania, where Reed has decided to take the foursome for vacation. Given the odd choice of locale, you might be surprised to find that neither a Dracula nor a Frankenstein are anywhere to be found! (Not to worry; they'll show up in Marvel stories starting in the next few years.) Yet despite the lack of vampires, there's still a force that seems to hypnotize the Thing from afar, getting him to leave his bed in the middle of the night and trudge through miles of wilderness to a sinister castle, where he is compelled to open a certain tomb - and thus free Diablo from the prison he's been sealed within for over a hundred years! it can be hard to find a bathroom in the middle of the night. When the rest of the Fantastic finally awake, they note Ben's absence with alarm and quickly track him down to the castle in question. It's then that they receive their biggest shock, as they find the Thing's rocky form partially cured! 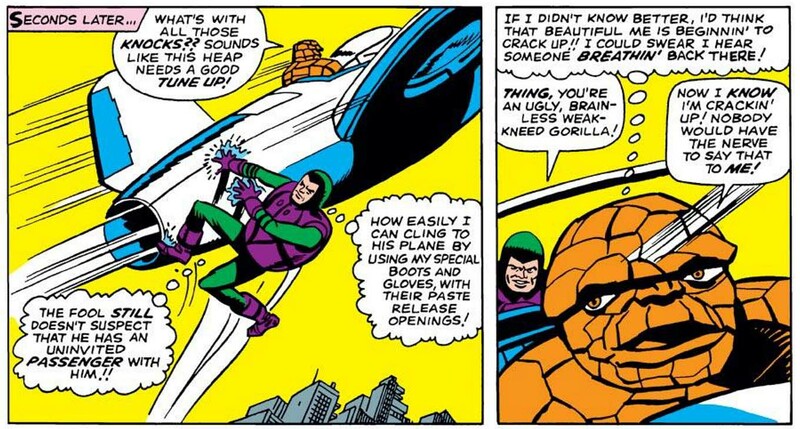 This is a canny and economical bit of plotting, as it not only provides Ben with a heart's-desire bit of temptation, effectively separating him from the rest of the group, but also provides readers with a reminder of just how different Ben Grimm is from the others. Out of the four who journeyed in that same fateful rocket, Ben is the only one who came back as something which could understandably be deemed a monster, and is the only member of the group whose life has been consistently handicapped by the change (any advantages notwithstanding). For the Fantastic Four's first handful of issues, Ben was thusly characterized by a large degree of self-loathing; however, Stan soon lessened this aspect of the character, perhaps intuiting that while such a trait might lend itself towards a finite drama, it might grate on readers as time went by. But Reed had vowed to his friend to never stop looking for a cure - so it's a surprise to all to see the antidote come not from Mr. Fantastic, but someone new! And Johnny looks positively gobsmacked! 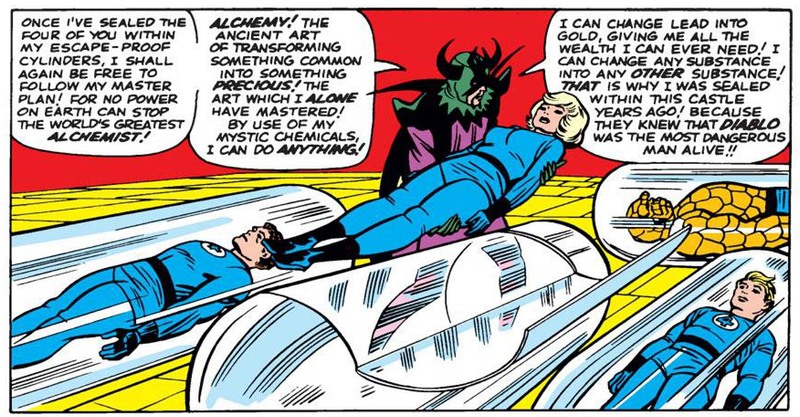 As soon as Reed, Sue and Johnny see the Thing's significantly regressed condition, Ben tells them that in return he's agreed to serve Diablo for the following year. Reed, of course, is flabbergasted by this declaration, assumes the Thing is under Diablo's mental control - and instantly attacks! But is he? What's interesting here is that the situation, as presented, is subtle enough that we honestly can't tell; after all, the change of heart is a sudden and drastic one, but Ben doesn't come off as a mindless automaton or seem otherwise out of character. Accordingly, the reader is forced to wonder: Is Reed's leap to the attack the mark of someone saving a friend who's been brainwashed, and therefore unable to help himself? Or is it instead the sign of someone so arrogant and sure of himself that he presumes to know the minds of his friends better than they know themselves? (And further, given Diablo's apparent ability to succeed where all of Reed's researches never could, we might wonder if jealousy is part of his real motivation as well.) We often talk about Stan's startling innovation at creating a group of heroes who don't always get along, but having our heroes' brilliant leader sometimes show these less than admirable traits really illustrates what sets the Marvel heroes apart from the rest. "It's Magneto's helmet on a plinth!" Perhaps the most refreshing thing about this issue, however, is the way the plot progresses at an almost dizzying speed. 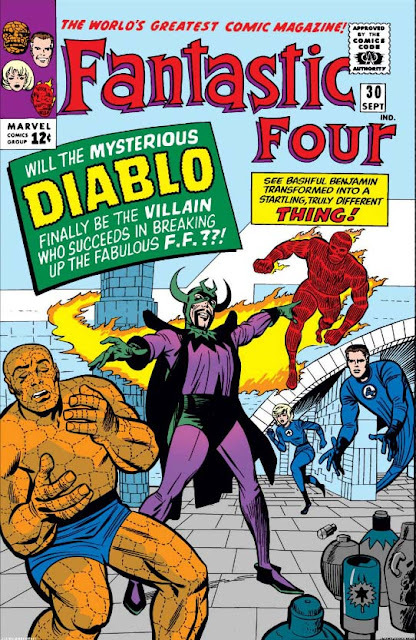 After Ben Grimm has freed Diablo, been transformed partway back to human and subsequently left the group, the remaining Fantastic Three depart - whereupon Diablo then begins dazzling the nations worldwide with his chemical wonders, offering instantaneous solutions to all manner of earthly ills. And this is only by page eight! There have been any number of issues where the tale has been hampered by its seemingly lackadaisical pace; after having written eight- or twelve-page stories for much of his career, Stan still seems occasionally troubled in his attempts to figure out the full potential of the feature-length format, and it's not been unusual to find the first several pages of a tale effectively stalling for time, possibly offering some enjoyable character moments but not much besides. Maybe Stan's finally begun to crack just how much plot can fit into twenty pages, and how many twists and turns can be offered when the material is condensed just enough. Everyone says these next couple of years are when Marvel really starts hitting its stride; if so, this might be yet another turning point down that road! "light as a feather, stiff as a board". Introducing, for the first time ever: Hawkeye the Masked Archer! And this character, who would go on to become one of the most well-known of the Avengers, certainly has some interesting beginnings. We can discuss any number of precedents, as The Archer has long been a well-loved archetype of fiction; Robin Hood, of course, being the most famous and quintessential example thereof. (Recall too that the definitive film version was portrayed by screen legend Errol Flynn, of whom Stan was famously a great admirer.) And though not explicitly spelled out in the narrative, the name "Hawkeye" is clearly taken from Natty Bumppo, the protagonist of Jame Fenimore Cooper's classic 1826 novel The Last of the Mohicans; notice how when we first meet Hawkeye, he's working for a carnival as their "World's Greatest Marksman" attraction (mirroring the excellence attributed to Bumppo), and dressed in the clothes of a frontiersman. 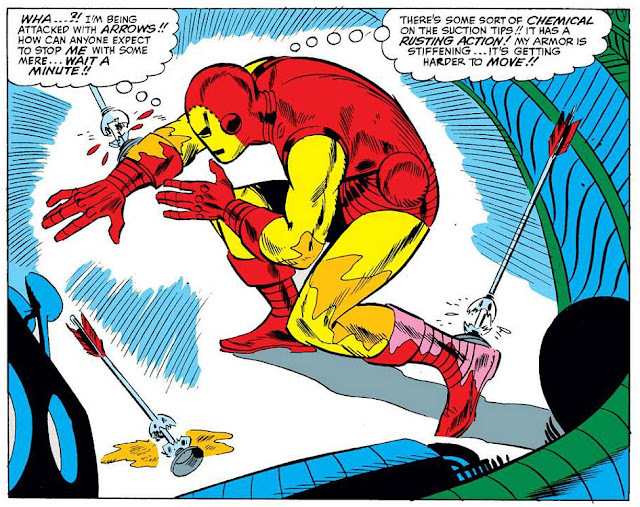 But the most relevant, and recent, comparison would be from superhero comics themselves, in the form of DC Comics character Green Arrow, who not only shoots with the same unerring accuracy, but similarly employs trick arrows - as Hawkeye does here, utilizing such novelties as suction-tipped grappling arrows, rust-inducing arrows, and even one tipped with a "demolition blast warhead" (!!). Green Arrow's high visibility means that this swipe must have been a blatant one; after all, GA had already been the star of a long-running backup feature in both Adventure Comics and World's Finest Comics - a 1958 run of which was illustrated by none other than Jack Kirby - and he'd joined the high-profile Justice League of America not much later, in 1961's issue #4 of their own title. Then again, Stan Lee has cited creating the Fantastic Four after being directed by Martin Goodman to ape DC's new superteam ... so if Hawkeye was (at least in part) a direct swipe, it was just the latest in a line! 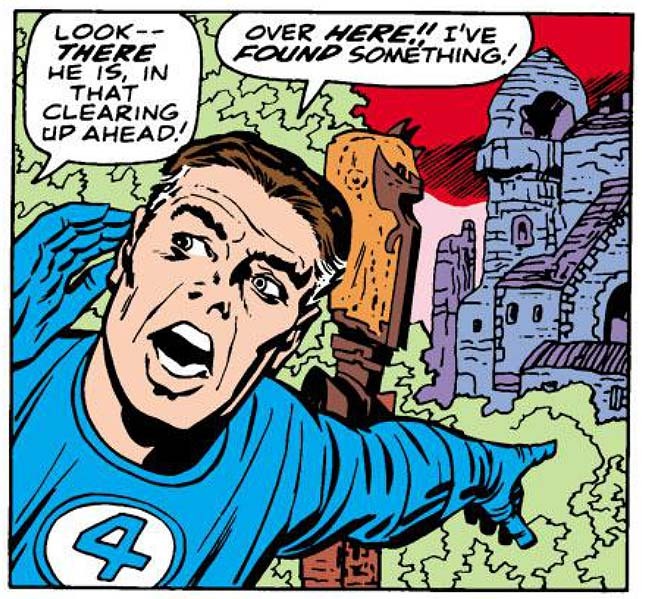 And yet with this new character, we can't help but ask: Isn't the role of an archer rather anachronistic, even by 1964? To be fair, the cover itself acknowledges this implausibility, and Iron Man's first reaction at being shot with arrows is one of bemused disbelief. Still, it does seem odd that a bow-and-arrow character could be conceived as a worthy antagonist in any time period which had also developed guns; heck, even 19th century Bumppo was most renowned for his skill with a rifle. One factor worth considering is that although personal firearms did exist in 1964, they perhaps didn't feature in the fiction of the time quite as prominently as they do today. Alternatively, it's not unreasonable to think that part of what makes characters like Hawkeye and Green Arrow so darn cool is the fact that they are skilled enough to still be complete badasses even when using weaponry so archaic; viewed this way, the choice of weapon becomes a deliberately showy, cocksure flaunting of one's excellence - similar to the boxer or swordsman so good that he can fight with one hand tied behind his back. "One of the most startling arch-villains of all time"? Not to bury the lede, but you may have heard of a little film called The Avengers which opened just over a week ago, and is currently annihilating box office records. So it's a funny bit of timing for me that fully half of the movie's team appears in this one comic! And yet, how much of the movie-going public would be surprised to find that the Black Widow and Hawkeye both started out as bad guys? The pair will start on their road to redemption the following year, though newcomer Hawkeye will have a bit of a head start over the Widow in being accepted by the Avengers; then again, he's shown from the first to be something of a reluctant baddie (as opposed to the Black Widow, at this point a femme fatale clearly devoted to her Communist leaders). 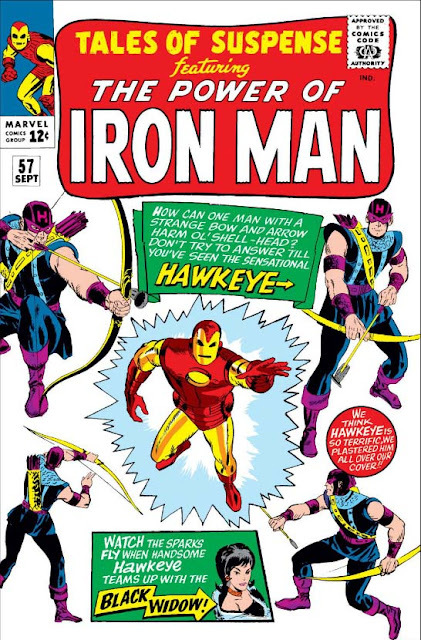 Hawkeye, see, starts out by attempting to foil a robbery - even if his main motivation is fame and recognition, envious of the public acclaim showered on heroes such as Iron Man. But when the criminals in question flee the scene, the arriving police think that he stole the loot, and he quickly finds himself on the run. In short, he's portrayed from the beginning as a very human character, with genuine flaws like jealousy, hotheadedness, and a certain gullibility, so it's easy to see why Stan might have gleaned, after a few early appearances, that the character might have even greater potential as a struggling goodie. 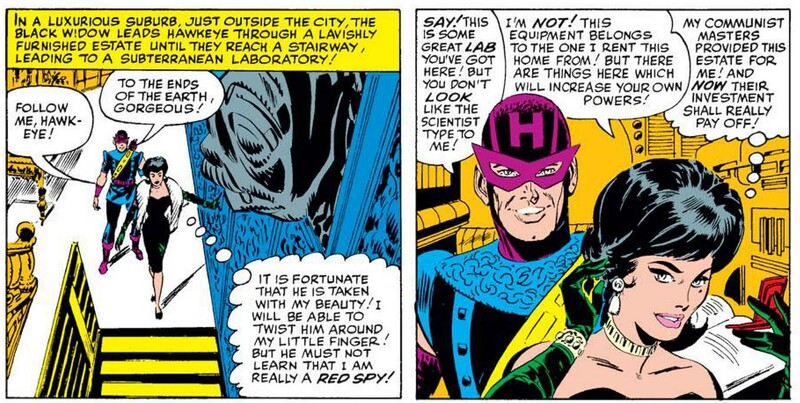 And in this way - although it was almost certainly accidental - Hawkeye reflects the conflicted nature of his namesake; just as Bumppo was both frontiersman and Native American, so Hawkeye will always (to some extent) straddle the worlds of both hero and villain, from his role as reluctant bad guy here, to his lasting reputation as something of a loose cannon later on. by the seductive Madame Natasha. Meanwhile, the 5-page backup strip "Tales of the Watcher" gives us "The Watcher's Power!" And it's a bit different than what we've seen before. When spacefaring invaders come to the planet on which the Watcher currently resides, we fear a disappointing retread of the story seen just two issues ago; after all, the space pirates land because they need a base from which to attack other words, and since the Watcher's vow of noninterference is well-known, they confidently proclaim - just as in the other story - that they have nothing to fear. But instead of cleverly stalling for time until it's too late, as before, we're shocked to see the Watcher not only melt their Giant Space Cannon with just a thought, but also alter the aliens' entire physiological makeup, before then throwing them through time and space to strand the aliens on a faroff prehistoric world. WOW! How, the reader wonders, could the Watcher do such a thing, and not break his sacred oath? Easily, as it turns out: Yes, he and his kind are sworn to never interfere in the affairs of other races, but the planet which the space pirates had intended to attack was actually none other than the ancient homeworld of ... the Watchers. to a trickster god's mischief.